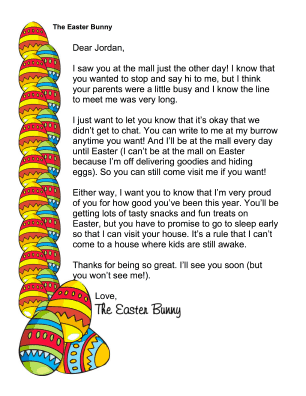 If your child wanted to see the Easter Bunny at the mall but didn't get the chance, give them this free, printable letter from the Easter Bunny that invites correspondence. I saw you at the mall just the other day! I know that you wanted to stop and say hi to me, but I think your parents were a little busy and I know the line to meet me was very long. I just want to let you know that it's okay that we didn't get to chat. You can write to me at my burrow anytime you want! And I'll be at the mall every day until Easter (I can't be at the mall on Easter because I'm off delivering goodies and hiding eggs). So you can still come visit me if you want! Either way, I want you to know that I'm very proud of you for how good you've been this year. 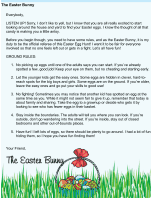 You'll be getting lots of tasty snacks and fun treats on Easter, but you have to promise to go to sleep early so that I can visit your house. It's a rule that I can't come to a house where kids are still awake. Thanks for being so great. I'll see you soon (but you won't see me! ).